Silverstar Casino proudly brings you Vikash Mathura and Jack Devnarain as Harry and The Gupta. Vikash Mathura reprises his role as "Harry", the brash Durban-based entrepreneur who has become a favourite amongst many theatre patrons. Jack Devnarain plays the suave and infamous businessman "Gupta", the elusive and media-shy youngest brother of a notorious family! 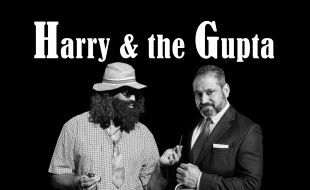 "Harry & the Gupta" is set in the mythical "Saxonwold Shebeen", where the story begins with Harry (Durban`s `Con of Cons`) meeting the Gupta (Joburg`s `Don of Dons`) for the first time.